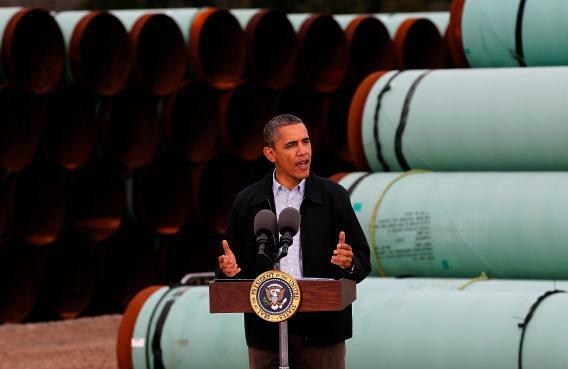 Nature editorial: Obama should approve Keystone XL pipeline. Obama speaks at the southern site of the Keystone XL pipeline in March 2012 in Cushing, Oklahoma. President Obama is in a tough spot. He and his State Department are under heavy pressure from environmentalists to reject the Keystone XL pipeline, which would pump crude bitumen from Canada’s oil sands to refineries in Texas. But they’re running out of excuses for doing so. Those urging Obama to ignore the activists and approve the pipeline include energy-industry interests, Republican politicians, Texans, Canadians, the U.S. Chamber of Commerce—and now the journal Nature. As Nature has suggested before, the pipeline is not going to determine whether the Canadian tar sands are developed or not. Only a broader — and much more important — shift in energy policy will do that. Nor is oil produced from the Canadian tar sands as dirty from a climate perspective as many believe (some of the oil produced in California, without attention from environmentalists, is worse). Tar-sands development raises serious air- and water-quality issues in Canada, but these problems are well outside Obama’s jurisdiction. Then comes the key line: “By approving Keystone, Obama can bolster his credibility within industry and among conservatives.” Nature’s idea is that the additional energy security would give the administration more leeway to focus on other environmental policies, like the EPA’s crackdown on emissions from coal-fired power plants. There’s some appeal to that logic. If Canada’s oil-hungry government is dead set on developing the tar sands no matter what the United States does—which seems to be the case—then it’s hard to see a lot of environmental upside in keeping that oil out of the United States. In contrast, ending the era of dirty coal and continuing to invest in new clean technologies could have huge benefits. But all of that assumes a Washington in which real tradeoffs are possible—one in which it’s possible to speak of Obama bolstering his credibility among conservatives while keeping a straight face. The environmentalists yelling in the president’s ear don’t see it that way. That’s why, if the pipeline is a political football, Obama’s strategy so far has been akin to that of the Cleveland Browns: punt, punt, punt. On Thursday, Reuters reported that the State Department may put off a decision once again, this time until June. Repeatedly kicking the ball away in order to buy time and field position may not please the crowd, but hey, it worked for the Browns, right? Oh, wait.